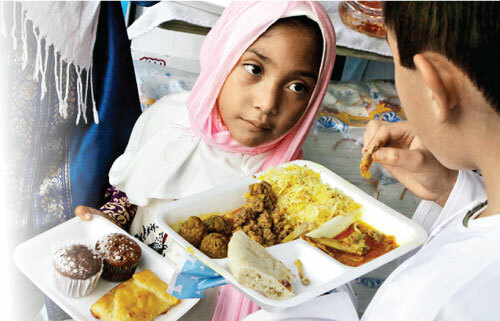 Eid ul Fitr Festival is the festival celbrated at the end of Ramazan, a period of fasting. It is a happy occasion when Muslims mark the accomplishment of fasting and thank Allah for giving them the self control to succeed. Islam has bestowed two festivals for its followers. They are Eid ul Fitr -the Ramazan festival and Eid ul Azha - the Hajj Festival. Both are celebrated after certain sacrifices. The festival begins at the first sighting of the new moon. Muslims attend special morning prayers and then visit friends and family. Many people wear new clothes and special food is served. Exchanging Greetings of Thakabal Allahu Minna WaMinka - O Allah accept us and others, thus forgetting past differences and unity and brotherhood is established. 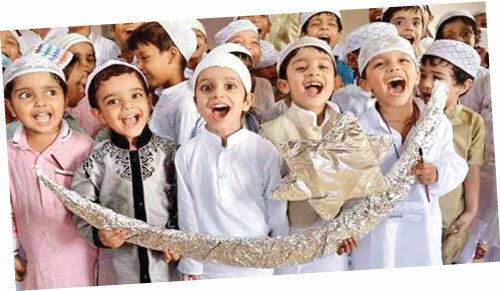 This festival generates immense satisfaction among children and adults. Soon after Eid prayers, Muslims go to the burial grounds to invoke the mercy of Allah and his forgiveness for the dead. While visiting the grave one should say, "Peace be upon you, O people of the grave. May Allah pardon you and pardon us. You are forerunners and we are following in your footsteps." May Allah accept our religious observances performed during the month of Ramazan and reward us in this world as well as in the hereafter. Our fervent prayer is for peace, harmony, tolerance, understanding and brotherhood.